I love this runner works perfect for the spot I have it in. Looks great! 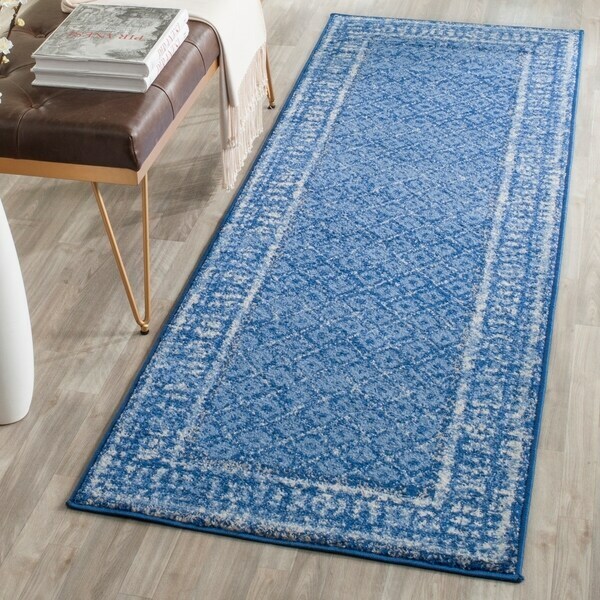 Safavieh Adirondack Royce Vintage Light Blue/ Dark Blue Rug - 5'1" x 7'6"
Inspired by global travel and the bold, colorful motifs adorning fashionable ski chalets, Safavieh translates rustic lodge style into the supremely chic and easy-care Adirondack collection. Crafted of enhanced polypropylene yarns, Adirondack rugs explore stylish over-dye and antiqued looks, making striking fashion statements in any room. This vibrant blue rug has a prominent border and a charming trellis pattern with accents of white and light blue. Not crazy about how bright this blue is. I was thinking it would be duller, like denim. It is really thin and I think the description of height was exaggerated. I would never have bought this rug in a store. I do like the design and the price. I have kept it because it goes in a back hallway. Returning it after unpacking it and trying it out seemed like too much of a hassle. This is a very vibrant blue rug and soft to walk on. It is fairly thin but makes a GREAT rug for in front of my kitchen sink and cabinets. I plan on buying another one for my laundry room. Mine is a runner and it works great in front of the washer and dryer. The price is amazing for its size. This rug is so brightly colored and looks as pictured. The quality is great and its incredibly soft. I put this rug in my kitchen to add a pop of color against the white cabinets and dark floors. We have this rug in our bathroom and it is soft and feels good on bare feet. Thick enough to step out of shower and not have water go through it to the floor below. It is a lovely pattern and colors. This is the perfect rug to greet the cats and dog when they come back into the house through the doggie door to the securely fenced back yard. The bright blue and green hues greet their often muddy or just dusty feet upon entry. Non-skid backing keeps it in place. Very easy to vacuum and shows well in the orange-ish walls of the used-to-be-dining-room but is now a sewing studio. Considering getting the 8 x 10 version for the empty master bedroom. I sleep in a smaller room on other side of house. Master is for the Migun massage bed, a camping cot and a cat condo. Cannot go wrong with this rug. Good quality rug. Well made and true to photo on web site. This is a good all around rug to accent s room with blue. It is bright. What a pretty rug at a great price. Better than I expected. Although the rug is thinner than what I had expected, it feels wonderful to the feet. The color is true to the picture and is well bound. The various shades pick up other colors in the room. Love this rug! Prompt delivery and excellent quality! Purchased these rugs to compliment my new wood floors. They look very nice! Great shades of blue. They really brighten up my little coffee shop with golden walls up to the chair rails, then dark brilliant blue above. Love that room. Nice quality for play room. Thin but soft with thicker rug pad. Color true to picture. Brightens room. Very soft! Color is true to the picture. a very pretty rug but not particularly well made. The corners are coming apart already. Very pretty rug. Looks nice where I have it. Matches another one in the order but smaller. The rug is the perfect color to match my bedroom color.